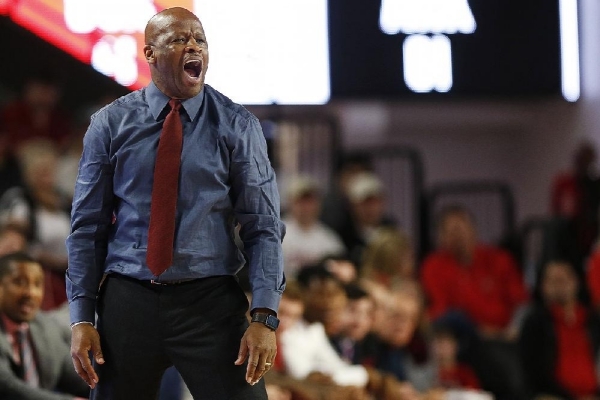 Arkansas coach Mike Anderson yells from the bench during the second half of the team's NCAA college basketball game between Georgia and Arkansas in Athens, Ga., Tuesday, Jan. 23, 2018. (Photo/Joshua L. Jones, Athens Banner-Herald)/Athens Banner-Herald via AP) WHERE Bud Walton Arena - Fayetteville, Ark. LAST MEETING Arkansas defeated Georgia 80-77 in double overtime on Jan. 23, 2018 in Athens. RADIO Razorback Sports Network can be accessed through local FM and AM affiliates , on the TuneIn app, XM Ch. NOTABLE After going 7 of 7 at Texas Tech, Razorbacks sophomore forward Daniel Gafford has increased his SEC-leading field goal percentage (66.7 percent) … Georgia 6-11 sophomore Nicolas Claxton is averaging 2.9 blocked shots to lead the SEC … Arkansas Coach Mike Anderson’s Alabama-Birmingham teams went 3-1 against Georgia Coach Tom Crean’s Marquette teams in Conference USA matchups … Georgia junior guard Jordan Harris, who has 17 starts this season and is averaging 4.8 points, is expected to miss his second consecutive game because of a concussion he sustained against LSU … Bulldogs freshman guard Tye Fagan who is averaging 3.6 points in 18 games off the bench, is questionable because of an Achilles injury … Arkansas sophomore point guard Jalen Harris is averaging 6.2 assists to rank third in the SEC … Razorbacks freshman guard Isaiah Joe was 0 of 5 on three-point attempts against Texas Tech, but he still leads the SEC with 68 made three-pointers … Arkansas is 10-3 against Georgia in Fayetteville and has won 5 of the teams’ last six meetings, including an 80-77 victory in double overtime last season in Athens, Ga.